Soane designed two schemes for altering Buckland House but neither was executed. Soane first visited the site to survey the house on 14 May 1792, and in June he delivered drawings for alterations to the library. Two years later, the basement storey was surveyed on 25 February 1794 and designs were made for its alterations. This drawing is a design for the latter scheme, showing offices in the basement. Although these two schemes were not carried through, it has been speculated that Soane may have built the existing stables (P. Dean, p. 183). Buckland House was built in 1755-8 by John Wood the Younger for Sir Robert Throckmorton. 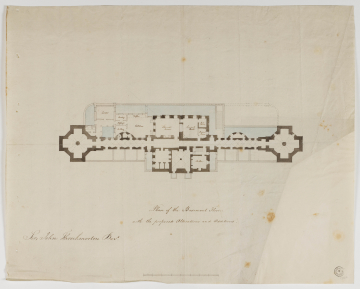 Soane's basement plan indicates the building's layout. The building had a broad frontage of 250 feet, with the central three-storey Palladian block linked by long passages to two octagonal terminal pavilions. P. Dean, Sir John Soane and the country estate, 1999, p. 183; G. Tyack, S. Bradley and N. Pevsner, The Buildings of England: Berkshire, 2010, p.215.